When doing Irish genealogical research my approach is to find the end-of-line ancestors and then come forward, filling out each generation as completely as possible. This includes finding all siblings, spouses, grandchildren, great-grand-children, and cousins. It is fascinating to see how the family multiplied, where and how they lived, their occupations, levels of education, interests, and sometimes, even heartaches. I found an article in the Logansport, Pharos Indiana Tribune from 1895 about “Dr. Joshua Pim, the lawn tennis champion of Great Britain and Ireland, is without doubt one of the greatest experts Americans have ever seen.” Thrilled with this new information I continued to research and found an article on Joshua written by Mark Ryan. This article was like a short biography. He included birth date and place, parents’ names, and then went on to describe Joshua’s career as a tennis player. 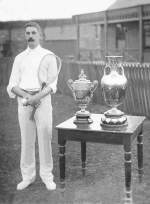 He actually won Wimbledon in his first appearance in 1890, and then played there again in 1891, 1892, and 1893. Joshua eventually gave up tennis to become a medical doctor. Eureka! Checking my data base I found Joshua Pim, born about 1870, Ireland, to Joshua Pim and Susan Middleton, the very same quoted in M. Ryan‘s article. Using this new information I was able to find a photo of Joshua Pim! Josh was no longer just a name - a dash between two dates - he was an actual person, a world champion tennis player, a medical doctor, a husband and father, and my fourth cousin three times removed. Joshua’s fourth great-grandfather, Richard Pim, is my tenth great grandfather. Another descendant, of Richard Pim, Abigail Pim, was born to John Pim and Sarah Clibborn in Dublin in 1767. She is my second cousin seven times removed. John and Sarah were both born in Ireland, had sixteen children, and then disappeared out of the Quaker records somewhere around 1780. More research led to finding a memorial tribute to Minister Abigail Pim from the Friends in England. Piety promoted, in a collection of dying sayings of many of the people called Quakers: with a brief account of some of their labors in the Gospel, Volume 2 edited by William Evans, Thomas Evans p.193, offers insight into Abigail’s life. While yet a child, her family moved to England. [No wonder the family had disappeared from the Irish records.] She had a frail physical constitution, but a sharp mind. She was inclined to spiritual values and felt herself called to the ministry at the age of twenty-nine. She believed that heeding “the still small voice” allowed one to walk the path of mortality in safety, avoiding the temptations of the adversary. After the death of her mother in 1812, Abigail visited Friends adjacent to London and also in Ireland. She also ministered to female prisoners in jail, reminding them of Christian values. A Wimbledon champion, tennis playing, medical doctor and a spinster who found peace in ministering to prison inmates and sharing the Truth as she lived and believed it. What wonderful things to discover about one’s ancestors. These are only two of the ten thousand descendants of Mr. and Mrs. Richard Pim, who have left their mark on the world. I just read your article on Joshua Pim. I didn't realize that comments were left on the article I wrote. Thank you for sharing. Your article is very well written and gave me new insights into my cousin.